“This Content Requires Media Player 12.7” Ads are pop-up advertisements which you can be provided with by either unreliable websites of adware programs. In the case of the latter, you should remove the adware program, because it is very likely that you find some other advertisements. “This Content Requires Media Player 12.7” Ads may differ slightly. Instead of version 12.7 you may be asked to install a different version of the program. Nevertheless, it is highly advisable to ignore these pop-ups because they are aimed at making you install unreliable programs. 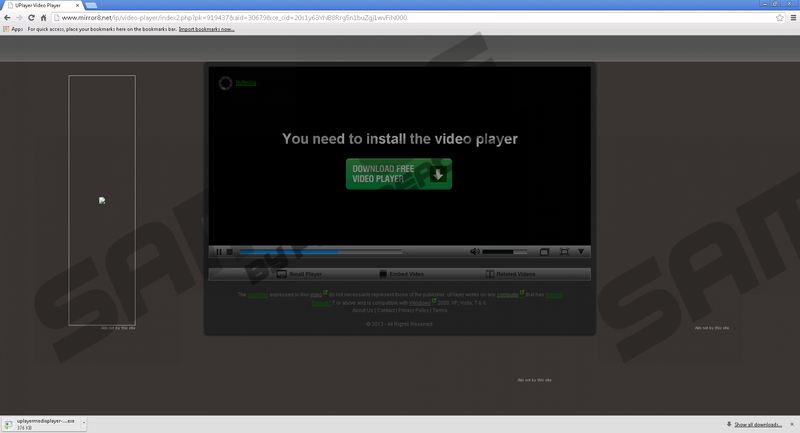 A “This Content Requires Media Player 12.7” advertisement takes you to a page of mirror8.net where they are provided with a notification which reads “You need to install the video player”. The page is dimmed, and at the bottom of browser window, you can find the phrase “Ads not by this site”. It implies that there is no need for you to install the recommended player, which is actually uPlayer, because it is just an advertisement. When you download and launch the installer of the application, you are provided not only with the outdated player, which is related to the famous VLC player, but also with a bundle of unreliable programs, some of which may change the settings of the browsers or consume great amounts of computer resources, leading to poor performance of the system. You may be invited to install Optimizer Pro, which is categorized as a potentially unwanted program because of a noticeable tendency for software distributors to promote it along with other programs. Moreover, you may find that the installer recommends that you install Conduit Search, Desktop Weather Alerts, or some other program. “This Content Requires Media Player 12.7” Ads should be ignored as well as other pop-ups displayed by adware programs or questionable websites. If you want to update or download some program that has its official website and is reliable, do not trust unknown software distributors. “This Content Requires Media Player 12.7” Ads are not the only advertisements that can provide you with bundled installers, some of which may spread highly dangerous computer applications; hence, you should be very careful when dealing with adware program and file sharing websites. When it comes to the removal of the programs related to “This Content Requires Media Player 12.7” Ads, we recommend that you implement a spyware removal tool, especially if you keep the computer unprotected. By installing a reputable compute security tool, you get a chance to find out what harmful files are present on your computer. After you uninstall an unreliable program, some of its components may remain within the computer. You can get rid of those unnecessary files or registry entries with the help of SpyHunter, which can also shield the system against many other computer threats. Uninstall uPlayer and other unwanted programs. To make sure that the computer contains no harmful files, implement the scanner available below. Quick & tested solution for This Content Requires Media Player 12.7 Ads removal.